Yesterday, was the first day in ages that I seemed to find time to sit down, relax and do a little yarn doodling! After completing two Christmas stocking projects for our 2014 grandbabies, I could not face anything wooly until now. Honestly, one of the stockings was being completed as Santa packed his sleigh – it was a real race. Anyway, these little bitties are Tawashis – a free pattern from Ssh, I'm Counting. I've made them from little scraps of cotton yarn, using a 4.5 hook. Not only am I using up little bits and pieces, I'm getting into the swing again for a larger project – limbering up, so to speak. They're meant for washing your face...use once then throw in the washer when you do your towels. We'll see how they work! Try some yourself. It's an easy pattern, great for when you're watching a movie. Do you ever feel you're in a bit of a rut, cooking the same old dinners week after week? So, a month or two ago, I started actively looking for some new recipes to try. Recipes that are flexible, that can be changed up a bit, depending on what's in the fridge. I've shared one already – Korean Beef Bowl. This is seriously good and you can have it on the table in twenty minutes. Click here for the recipe. Today's suggestion is Cheesy Baked Spaghetti Squash from Dinner With Julie. Think lasagna without the noodles. Think spaghetti squash plus sauce plus cheese. That's it. Julie doesn't even really give a recipe, just some guidelines. First, prep your spaghetti squash, either in the oven or in the microwave. Microwave: Preheat whole squash 1 minute. Halve lengthwise, remove seeds and membranes. Place cut side down in casserole dish. Add 1/4 – 1/2 cup water. Cook on high for 12 minutes. Test to make sure it's fork tender. Drag your fork through the inside of the squash in multiple directions until you have a pile of strands. Leave the strands in your squash “boats”. Oven: Cut your squash in half and remove seeds and membranes. Bake in oven at 375 for 30 minutes. Use your fork to stir up the strands. Pile a generous layer of sauce on top of each squash boat (allow one per person) and then heap on some grated mozzarella. Bake at 375 for half an hour. That's it! Enjoy! ... healthy, happy, feeding and sleeping well! We're so pleased! While her mum adjusted to the new addition, I spent a significant amount of time playing Little People, constructing tents out of blankets and reading stories. Spending time with little ones slows life down. That's a good thing. A little stroll down Memory Lane today! I've had this recipe since Grade 8. Mrs. Baker, mother of my best friend at school that year, passed it along. I loved it, especially when it was warm from the oven. It's a simple cake, no special ingredients, no complicated directions, no icing required... a nice treat if people drop by for coffee kind of cake! Rub together until you have light crumbs. Add ingredients to bowl and mix. Sprinkle on the 1 cup of topping you set aside. Try this idea with the fall leaves you pick! I saw a great idea on Facebook this morning! Before pressing fall leaves, cut out some interesting shapes using a scrapbook punch! Preserve the little shapes just as you would a regular leaf and use in future projects. Not sure how to preserve leaves? Click here. There were no written directions with the Facebook post, but I would suggest you take care to “clean” your punch afterwards by punching a number of paper shapes and allowing the punch to air dry thoroughly. Yes, it's something I'm “all caps” excited about. Peanut butter was a no-no at our school. Allergies made it a risky proposition in a classroom, so peanut butter was restricted to weekend sandwiches on the ski trail. Now, move over and make room for my jar of pb! Today at lunch, we “taste tested” two interpretations of an upscaled version of the classic peanut butter sandwich: Grilled Peanut Butter and Peanut Butter French Toast. Am I the last person in Canada to try these? ...or here if you feel inclined to whip up Peanut Butter French Toast. Not that you really need a recipe. For the Grilled Peanut Butter I used raisin bread, peanut butter and a drizzle of chocolate sundae topping to make a sandwich. Butter the outside (both sides) of your sandwich and gently fry in a non-stick skillet until nicely toasted on both sides. For the Peanut Butter French Toast version, after constructing my raisin bread, peanut butter and chocolate sandwich, I dipped the sandwich in one beaten egg, coating well. Again, gently fry in a non-stick skillet until nicely browned on both sides. Top with syrup, whipped cream or whatever you enjoy most on pancakes or conventional French toast. 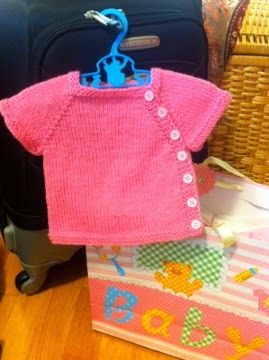 Fresh off my needles, I'm pleased to introduce a sweet little newborn sweater designed by Kelly Brooker. Entitled, Puerperium Cardigan, it's a free pattern knit all in one piece on size 4 mm needles using an 8 ply/DK weight yarn. Yeah! No sewing pieces together. It does have all those buttons to sew on, however! : ) Click here to get to Kelly's website. She has a larger version for sale, but scroll to the bottom for the (free!) newborn pattern. This version has short sleeves but there are directions for both straight and tapered long sleeves. Notice how my suitcase is packed? Yes! Any day now, a new little grandbaby! I'm ready!